Growing up, I never wanted to be a web designer. In fact, throughout my life, I wanted to be a schoolteacher, a journalist, a filmmaker, a radio personality, an event planner…the list goes on and on. Now, if you actually take a look at my resume, you’d find that I actually explored all of these occupations in one way or another. But during my third year of college, I began to truly struggle with the question: what do I want to be when I grow up? Luckily, that same semester, I took my first Graphic Design class, and the answer was suddenly clear. I loved creating concepts and executing them. I loved facing a problem, coming up with a million solutions, and implementing the simplest, most effective one. A year later, I took a class called “Multimedia and Web Design”. During the course, we learned the basics of web design, and eventually built out a website. From the moment I first saw my Photoshop concept implemented on the web, I was hooked, and the rest is history. 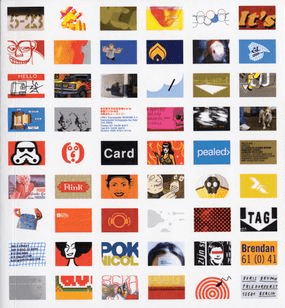 So what does this have to do with designing a business card in 2013, you ask? Well, this week, I had the opportunity to flirt with my first design love: print. As a web designer, I don’t get to experiment with the print medium nearly as often as I’d like, so this week, I have decided to devote this week’s article to Optimum7’s new business cards and the work that went into them. Business Cards! Eh, Who Needs ‘Em? In short, you do. Although most of us live in a web-based world, I don’t think that anything can truly replace the good old-fashioned business card. I understand that you already have a Facebook profile, a Twitter account, a LinkedIn Page, etc. but isn’t it simpler to have all of that information, as well as any other pertinent contact information, printed out in a single spot? Of course it is! Business cards provide a professional way to distribute your contact information, and help you avoid that awkward pen-searching moment when meeting a potential client or business contact. 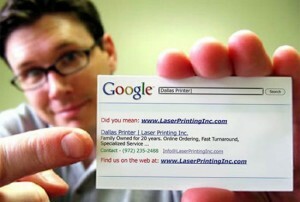 In addition, a business card is an excellent way to demonstrate your creativity. Anyone can sign up for Facebook or send a Tweet, but it takes true skill to effectively present your business model on a 2” x 3.5” space. Finally, a business card is tangible, a link is not. In this fast-paced, multi-tasking world we live in today, I find that my memory gets worse each and every day. (Or maybe that’s just me getting old…) Either way, I find it more and more difficult to remember tasks, important dates, and worst of all, names. This is where business cards come in handy. What if I meet a potential client while traveling on a Tuesday, only to forget his last name on Thursday when I return to the office? I can’t very well Google “Joe from that plumbing company”. A business card can be used as a gateway for your online presence. It is just one more way to get people to visit your site, check out your Facebook page, etc. 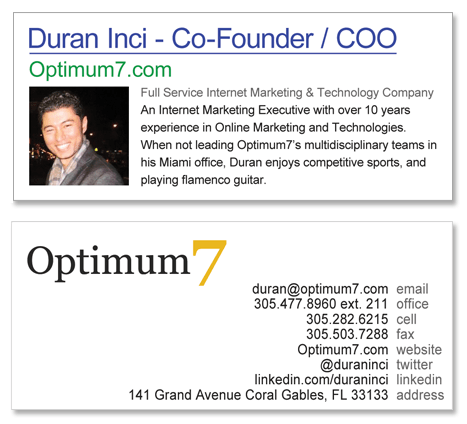 So that is why I have had the Optimum7 business cards on my desk for a redesign for about three months. I know it is important, but until this week I just haven’t had a moment to truly sit down and give this project the attention it deserves. When I began designing, I decided that I wanted to do something much more fun then our old business cards. While the old cards are truly well designed and laid out, they aren’t exactly as creative as I’d like. And when my boss gave me permission to “go crazy and get creative,” I was pretty pumped. And so begins the actual design process. As with any other design project, the first step to success is always research. I began reviewing several sites full of beautiful, creative business card design. For those of you in my Google+ community, Web Design for Beginners, you know all about that as I posted about 20 sites that I liked last Friday. For those of you who aren’t in my community (shame on you!) I have included a list of resources at the end of this article to help inspire your next business card design. What a perfect idea for an Internet marketing company! But, alas, the idea was obviously already taken. However, I liked the idea of using something related to search engines for the cards. For anyone who doesn’t know, this is called an “Author Rich Snippet.” An author rich snippet consists of a specific author’s picture, name, and a “More by” link that’s added to a standard search result. For these snippets to show up, you must have a Google+ profile, a headshot, and access to the site where you contribute articles. These snippets are important because they help your articles stand out, establish your author authority, build trust, and allow readers to more easily connect with you. At Optimum7, we put a lot of emphasis on creating a steady-flow of useful, detailed, well-written content (hence the weekly articles!). What better way to demonstrate Optimum7’s commitment to quality and excellence then to create rich snippet business cards! Immediately, I began researching whether or not this idea had already been snatched up by someone else, and to my surprise, it hadn’t! In addition to using the standard rich snippets format on the front of the card, complete with a headshot, I also included the standard contact information on the back. Because the card is so simple in color and type choice, I wanted to avoid the standard size. Instead of the standard 2” x 3.5”, this card was printed at 1.5” x 3.5” with a matte finish. This size will still fit nicely in a standard business card holder, in your wallet, or in a pocket but still stands out against its competitors. When designing your business cards, remember that it is important to use the right resolution, color model, margins, and bleed. When printing, you should have a resolution of at least 300 DPI, or dots per inch. However, larger printing jobs, for example- a 6’ x 8’ banner, only require 150 DPI. When in doubt, ask your printing company. Do not use RGB when printing. The proper color model for printing is CMYK. Also note that the colors on your screen will NEVER match the colors that your printer spits out. Because your monitor is backlit, the colors on the screen will almost always be brighter than when printed. If you are creating print materials for a larger company, you will often be asked to use Pantone colors. Pantone is a standardized color matching system, using a specific numbering system for identifying colors. Only by using Pantone colors, you will get the exact same (and correct) colors every time. For example, Tiffany & Co. uses only PMS1837 as its signature Tiffany blue. In fact, the color is protected as a trademark and isn’t available in the Pantone Color system books. Unless otherwise specified by your printing company, your margins and bleeds should be at least 0.125 inches depending on the size of the card. A margin is the distance from the edge of the card to the actual design. In my example above, the margin would be between the edge of the card and the text and headshot. The “bleed” refers to the printing that goes beyond the edge of the page after trimming. Because there is no printer that prints right to the edge of a piece of paper, designers extend the artwork (usually a background color or other design) past the edge of where the card will be cut. When designing a business card, please don’t use effects “just because”. This is really true of any design work, but I think it is definitely worth mentioning here. Excellent design requires intention. Every aspect of your work should be completely intentional. If you want to use a cutout or a square card, make sure that you can justify it. If you find yourself wondering why you made a decision in your design, it is perhaps time to start rethinking that choice. Does your business need some assistance in the print design department? Contact us today, and let me create an excellent, well-researched solution for you!